Alternate Universe Schiller The Same Except For Beard. Physicists at the Massachusetts Institute of Technology, peering into an alternate universe through a rip generated in the fabric of space, have determined that the Phil Schiller in the alternate universe is exactly the same as this universe’s Phil Schiller, except he has an evil-looking beard. Dr. Ranjit Vij, chief of MIT’s Dimensional Research Program revealed the findings today at a press conference where he referred to our universe’s Schiller as Schiller A and the alternate universe Schiller as Schiller B. “We observed Schiller B over a period of three weeks and he seemed in all regards the same as Schiller A. A highly competent professional executive at Apple Computer. Enjoys the same lunches, the same movies. Everything the same. According to Vij, Schiller B also indicated a penchant for hockey and exhibited several other characteristics that could be interpreted as Canadian, the same as Schiller A. Contrary to expectations, Schiller B was not in any way evil, other than having what could be considered an evil-looking beard. “I don’t think there are really any important conclusions to draw from this,” Vij said. Actually what about that white apple symbol on Schiller B. Don’t that indicate a different sense of style. I think Schiller looks like that moron from Home Improvement after too many lunches. And I only noticed it when I saw him with the beard. Even though the guy from Home Improvement _doesn’t_ have a beard. How odd. Gaahh, what’s his name? I like the apple logo with the sword through it. Awesome reference to a great one of the old episodes! Phil’s insignia demonstrates an especially keen eye for detail. Well, maybe not the absolute worst, but c’mon, I know you guys can do better than that. So, am I to take it from the logo that in the mirror universe, Apple is a totalitarian state controlling the earth? mr. moltz…i will consider it. What the article failed to mention is that, despite being outwardly normal, Schiller B was observed walking his two sexbots on a leash. Schiller A would never put his sexbots on a leash. He lets them run free on his 300-acre estate. How do you get into the alternate universe? It looks pretty cool. That still gets me. I now have no idea whether he is Canadian or not. Mr Moltz, you have suitably confused my reality. In the Star Trek episode alluded to, Star Fleet has a war-like culture where you may progress by murdering your superior (they also have a cool logo with a sword through it). Is the Apple of this alternate universe like that? Is there a Sulu B character trying to kill Steve B just like he was Kirk B? Is Schiller B the one ‘human’ keeping Steve B from being murdered? Has Steve A and Steve B been switched? Is that the reaon for Steve As disappearence from work? Is Schiller B the only one who sees the insanity of it all? I HAVE TO KNOW !!!!! Schiller! Schiller! Schiller! Schiller! Schiller! Schiller! Schiller! Schiller! Schiller! Schiller! Schiller! Schiller! Schiller! Schiller! Schiller! Schiller! Schiller! Schiller! Schiller! Schiller! Maybe this means that Schiller A is the evil Schiller and everyone at Apple is just afraid to say anything. That would tend to support the rumors I’ve heard out of Apple about Schiller A having emplyees stuffed and mounted instead of fired. But then again that could of been referring to the secretary that he took to the all-u-can-eat restaurant and then nailed back in his office. wait, if Schiller B isn’t evil, doesn’t that mean, by all that governs the laws of science and B movies, that Schiller A must be evil? When has a twin from an alternate dimension NOT been evil? In fact, when has a recently-discovered twin, regardless of dimensionality, not been evil? Uh PoisedNoise, do you mean Wilson? The dude behind the fence? Or to you mean Tim Allen, the star? That’s the guy, Tim Allen. Obviously I mean him. One, it looks like him, two, we’ve never seen Wilson, have we? I thought (though I only ever saw a few episodes) that that was the joke, poor though it was…. Lets not confuse story lines – Spock A and Spock B were both ‘good’ thus Schiller A and Schiller B can both be ‘good’. It was Kirk and most of the crew that were good in one universe and bad in the other. Except the cute woman hanging with Kirk B as I remember, she was good in both universes. I still want to know – what is Apple like in the B universe? Is it anarchy? Are they evil dictators controlling the computing industry? Is Joswiak trying to kill Jobs to get promoted? Did HyperCard get killed there too? Would MS be the good one in the B universe? We’re all still waiting for “Del” to post a picture of herself and prove whether she is worthy of the self-proclaimed “sexbot” title she gave herself. 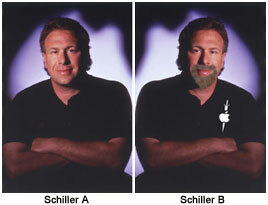 My beard looks better, where Schiller B’s is merely illogical. So in the alternate universe Michael Dell would be flipping burgers at an IN-N-OUT somwhere, right? IN-N-OUT is the best burger place on Earth, I pity your White Castles. I wanna Schillathon., Sorry SCHILLATHON! I think people just don’t have their history correct. The Spock B was evil. Just not as evil and Kirk B. Blonde hottie B was all kind of back-stabbing railer trash to blonde hottie A’s dignified non-skankitude. And don’t forget that in universe B, all the guys in red shirts actually survived to the end of the shoe. Back-stabbing-blonde-trailer-trash doesn’t necessarily mean “bad”. Geesh, let’s not get all prejudiced on this board or anything. Previous Previous post: Someone, Somewhere Upgrades To Run New Care Bears Game. Next Next post: Apple Fails To Make Inroads With People Who Will Never Buy A Mac.